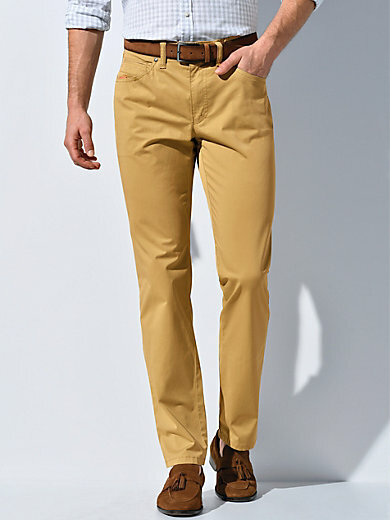 Trousers by CLUB OF COMFORT – HENRY: comfortable fit, normal waist height and thigh width. Featuring COLDBLACK technology, the functional SUN REFLECTOR. Made from summery high-stretch “Supreme Cotton”, a fine cotton blend tested for harmful substances to OEKO-TEX® Standard 100. The COLD BLACK finish causes the sunlight to be reflected, meaning that darker colours also do not heat up – ideal for hot summer temperatures. 5-pocket design with a phone pocket in the front pocket, a zipped pocket in the right back pocket, elasticated waist and shirt stays. Belt not included. 96% cotton, 4% elastane. Ankle width in size 50 approx. 38cm/15ins. The trousers are machine washable.